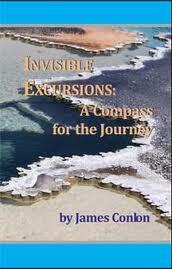 “Invisible Excursions: A Compass for the Journey” by James Conlon is a memoir of sorts. Conlon tells the story of his life as it unfolded during pivotal events like the Vietnam war and Vatican II but he also discusses his emerging love affair with creation spirituality. As the book progresses the memoir comes to the present day where Conlon talks about the Sophia Center where he is Director. However, that truthful, but remarkably bland, descriptive paragraph does not do “Invisible Excursions” justice. It tells the story of a questing, compassionate Christianity that I wish we heard more about these days. One that knows matters of taking care of our planet and social justice are equal to, and work with, matters of theology. Conlon doesn’t just share his personal journey, he tries to inspire you to look at your own journey and make the most of it. He shares a few of the journeys of those who came to the Sophia Center. Ultimately I feel that “Invisible Excursions” is meant to give us hope in a time when despair is pretty easy to find, and more importantly, Conlon wants you to take that hope and pass it along.